I'm going for 4 with this card. I've had this cute mermaid for a couple of years, she's from http://eurekastamps.com , she's one of the first unmounted stamps I bought. At first I put Alene's Tack-It Over & Over on the backs of my unmounteds, that was a little time consuming and I'm more of an instant girl, I discovered I could put repositionable glue dots on the back and it works just fine with my acrylic blocks. A little explanation--there are some little flowers, a heart, she's for my youngest granddaughters bd, I hope fishy mermaids qualify as animals, and the pearls are pink. I think that covers 4. Supplies: Card Blank White 5" X 7" Value Pack-Hobby Lobby, brown and white card stock-my paper stash, green vellum-Hot Off The Press Paper Pizazz Pastel Vellum, Die Cuts with a View-Pastel Prints mat stack, Xyron 500 sticker machine, Ink: Ranger Archival Ink: Jet Black, Sepia, LuminArte Twinkling H2O's-chiffon pink, natural linen, persimmon, sky blue, blue grass, Stamps: Lg. mermaid-Eureka Stamps, Stamp Tapestry-heart peg, My Sentiments Exactly-Y526 Multi Retro, metallic cord-Michael's, rub-ons-Bazzill White/Gold Leaf, crystal stickers-pearls, Fiskars Cloud 9 Design-rain drops, Sharpie permanent marker-pink to color pearls, CTMH markers-black, chocolate, pop dots. Holy cow I just feel off my chair! This is fabulous!!! Simply stunning! Thanks for playing. Love your card. That mermaid is STUNNING! 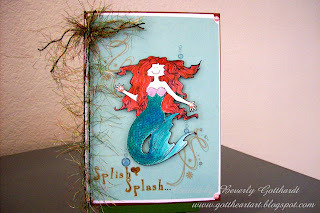 Love the coloring you have done with it..
Gorgeous card, the mermaid is stunning. Thanks for joining us at SSC. This is fabulous. Such a gorgeous mermaid and I really love the fibres. Thank you for joining us at the Colour Create Challenge. Cute card! Love the stamp! Great tip about the glue dots.. wouldn't have thought of that! Thanks! What an adorable mermaild! I just love it! Fab card love the mermaid! 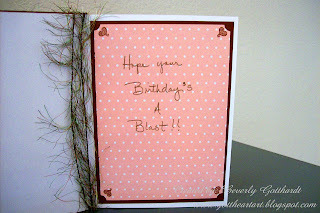 Gorgeous card Beverly, love the mermaid image. Thanks for joining us at SSC!